Pentatonix is truly a group for the age of the internet and reality TV. The group formed in Arlington, Texas, gained a following through YouTube, and won ABC’s The Sing-Off in order to earn themselves a record deal with Sony. It’s been almost seven years since they won the since-canceled competition and the group is now bigger than ever. 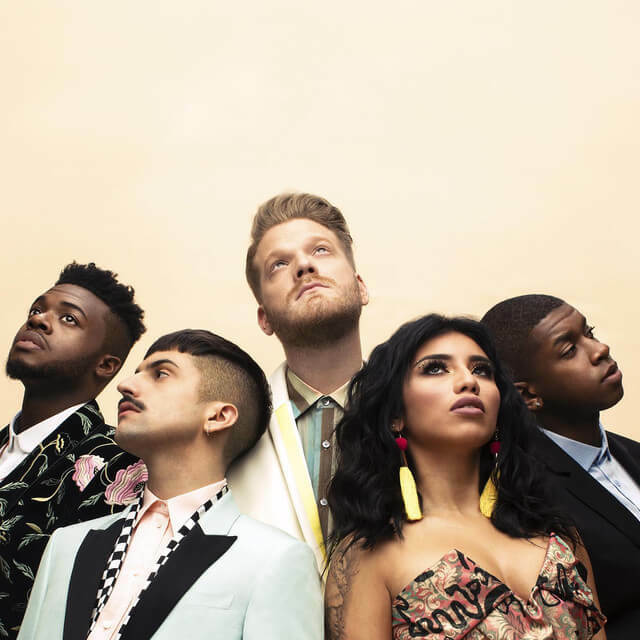 They’ve amassed nearly 15.5 million subscribers on Youtube, their new album, PTX Presents: Top Pop, Vol. I, debuted at number 10 on the Billboard 200, and they are in the midst of one a nationwide tour that takes them to Stir Cove this Tuesday. The Reader spoke with tenor Mitch Grassi about pop hits, touring, and what it’s like to add a new member. Your Daft Punk mash-up is one of your biggest hits. Is there another artist that you guys would relish getting to do a career-spanning mash-up of? We were just discussing this the other day with fans, actually! I think it would be so fun to do an Ariana Grande medley, especially since her new album is gaining a ton of traction right now. To be an a capella singer you have to be a really talented arranger of music in addition to being a great performer. With that in mind, I assume you guys are always looking at music in a really analytical way. Can you give me an example of a pop song that you guys haven’t covered yet that you think would lend itself well to an a cappella arrangement? Anything with a simple, melodic little hook works very well. The first song that comes to mind is that Maroon 5 song with SZA ‘What Lovers Do.’ So many sweet melodies and harmonies to work with! There are so many moving parts in your live show. How long are you guys practicing for before you hit the road? For this particular tour, we had about two weeks to put the stage show together. Of course, a tour of this magnitude has a lot that goes into it, especially when it comes to production and technology, so a lot of that was planned far in advance. Going off that, a cappella, more so than other types of live music, seems like it fairs much better when performed in an indoor space. Do you guys find any difficulties in performing in amphitheaters or open air festivals? There are just as many difficulties as indoor venues, really. If the shape of the room is unusual or lends itself to lots of slapback and/or echo, it can be difficult to stay together. You guys introduced Matt during October of last year right before a busy holiday season. How do you think the group dynamic has changed now that he’s had about a year to integrate? It’s been nothing short of amazing. He’s brought a fresh, positive new energy to the group dynamic, and we couldn’t be happier to have him on board. He’s a great performer and an extremely hard worker! For tickets to Pentatonix check out Ticketmaster.